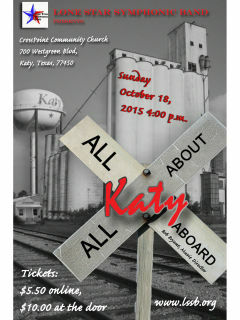 Lone Star Symphonic Band presents All Aboard/All About Katy! The Lone Star Symphonic Band will pay homage to Katy’s history and heritage in a Fall Concert. Selections to be performed at this concert include pieces celebrating the area’s history and heritage, such as being known for the geese that migrate to the rice fields each year. The band will also play selections that celebrate the growth of the Katy area over the last several years (Katy is the home of the “hottest selling zip code in the state”).Other selections will honor the City of Katy being known as “The City of Churches” at one time in its past. The band will also play selections that will feature the early settlers, farmers, ranchers, and cowboys and all their associated equipment that once populated the area.